This chapter discusses possible security vulnerabilities any authentication server could have and how Red Hat Single Sign-On mitigates those vulnerabilities. A good list of potential vulnerabilities and what security implementations should do to mitigate them can be found in the OAuth 2.0 Threat Model document put out by the IETF. Many of those vulnerabilities are discussed here. Red Hat Single Sign-On uses the public hostname for a number of things. For example, in the token issuer fields and URLs sent in password reset emails. By default, the hostname is based on the request headers and there is no check to make sure this hostname is valid. If you are not using a load balancer or proxy in front of Red Hat Single Sign-On that prevents invalid host headers, you must explicitly configure what hostnames should be accepted. The Hostname SPI provides a way to configure the hostname for a request. Out of the box there are two providers. These are request and fixed. It is also possible to develop your own provider in the case the built-in providers do not provide the functionality needed. This is the default hostname provider and uses request headers to determine the hostname. As it uses the headers from the request it is important to use this in combination with a proxy or a filter that rejects invalid hostnames. The changes that have been made from the default config is to add the attribute default-host="ignore" and update the attribute alias. default-host="ignore" prevents unknown hosts from being handled, while alias is used to list the accepted hosts. The fixed provider makes it possible to configure a fixed hostname. Unlike the request provider the fixed provider allows internal applications to invoke Red Hat Single Sign-On on an alternative URL (for example an internal IP address). It is also possible to override the hostname for a specific realm through the configuration of the realm in the admin console. This is the recommended provider to use in production. By default the httpPort and httpsPort are received from the request. As long as any proxies are configured correctly it should not be necessary to change this. It is possible to configure fixed ports if necessary by setting the httpPort and httpsPort properties on the fixed provider. In most cases the scheme should be set correctly. This may not be true if the reverse proxy is unable to set the X-Forwarded-For header correctly, or if there is an internal application using non-https to invoke Red Hat Single Sign-On. In such cases it is possible to set the alwaysHttps to true. To develop a custom hostname provider you need to implement org.keycloak.urls.HostnameProviderFactory and org.keycloak.urls.HostnameProvider. Follow the instructions in the Service Provider Interfaces section in Server Developer Guide for more information on how to develop a custom provider. The Red Hat Single Sign-On administrative REST API and the web console are exposed by default on the same port as non-admin usage. If you are exposing Red Hat Single Sign-On on the Internet, we recommend not also exposing the admin endpoints on the Internet. This can be achieve either directly in Red Hat Single Sign-On or with a proxy such as Apache or nginx. For the proxy option please follow the documentation for the proxy. You need to control access to any requests to /auth/admin. To achieve this directly in Red Hat Single Sign-On there are a few options. This document covers two options, IP restriction and separate ports. It is possible to restrict access to /auth/admin to only specific IP addresses. The following example restricts access to /auth/admin to IP addresses in the range 10.0.0.1 to 10.0.0.255. It is possible to expose /auth/admin to a different port that is not exposed on the Internet. The following example exposes /auth/admin on port 8444 while not permitting access with the default port 8443. A brute force attack happens when an attacker is trying to guess a user’s password. Red Hat Single Sign-On has some limited brute force detection capabilities. If turned on, a user account will be temporarily disabled if a threshold of login failures is reached. To enable this feature go to the Realm Settings left menu item, click on the Security Defenses tab, then additional go to the Brute Force Detection sub-tab. 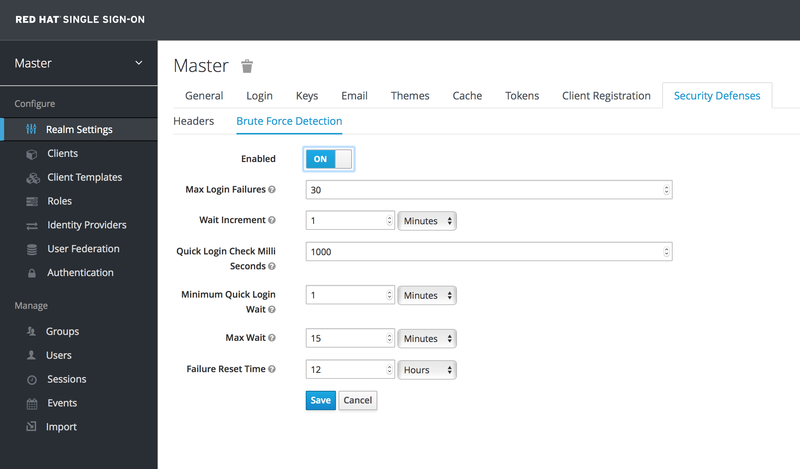 There are 2 different configurations for brute force detection; permanent lockout and temporary lockout. Permanent lockout will disable a user’s account after an attack is detected; the account will be disabled until an administrator renables it. Temporary lockout will disable a user’s account for a time period after an attack is detected; the time period for which the account is disabled increases the longer the attack continues. Maximum number of login failures permitted. Default value is 30. Minimum time required between login attempts. Default is 1000. Minimum amount of time the user will be temporarily disabled if logins attempts are quicker than Quick Login Check Milli Seconds. Default is 1 minute. Amount of time added to the time a user is temporarily disabled after each time Max Login Failures is reached. Default is 1 minute. The maximum amount of time for which a user will be temporarily disabled. Default is 15 minutes. Time after which the failure count will be reset; timer runs from the last failed login. Default is 12 hours. When a user is disabled they can not login until an administrator enables the user; enabling an account resets count. Login failures when a user is temporarily disabled do not increment count. The downside of Red Hat Single Sign-On brute force detection is that the server becomes vulnerable to denial of service attacks. An attacker can simply try to guess passwords for any accounts it knows and these account will be disabled. Eventually we will expand this functionality to take client IP address into account when deciding whether to block a user. A better option might be a tool like Fail2Ban. You can point this service at the Red Hat Single Sign-On server’s log file. Red Hat Single Sign-On logs every login failure and client IP address that had the failure. Fail2Ban can be used to modify firewalls after it detects an attack to block connections from specific IP addresses. Another thing you should do to prevent password guess is to have a complex enough password policy to ensure that users pick hard to guess passwords. See the Password Policies chapter for more details. The best way to prevent password guessing though is to set up the server to use a one-time-password (OTP). With clickjacking, a malicious site loads the target site in a transparent iFrame overlaid on top of a set of dummy buttons that are carefully constructed to be placed directly under important buttons on the target site. When a user clicks a visible button, they are actually clicking a button (such as a "login" button) on the hidden page. An attacker can steal a user’s authentication credentials and access their resources. By default, every response by Red Hat Single Sign-On sets some specific browser headers that can prevent this from happening. Specifically, it sets X-FRAME_OPTIONS and Content-Security-Policy. You should take a look at the definition of both of these headers as there is a lot of fine-grain browser access you can control. In the admin console you can specify the values these headers will have. Go to the Realm Settings left menu item and click the Security Defenses tab and make sure you are on the Headers sub-tab. By default, Red Hat Single Sign-On only sets up a same-origin policy for iframes. If you do not use SSL/HTTPS for all communication between the Red Hat Single Sign-On auth server and the clients it secures, you will be very vulnerable to man in the middle attacks. OAuth 2.0/OpenID Connect uses access tokens for security. Without SSL/HTTPS, attackers can sniff your network and obtain an access token. Once they have an access token they can do any operation that the token has been given permission for. Red Hat Single Sign-On has three modes for SSL/HTTPS. SSL can be hard to set up, so out of the box, Red Hat Single Sign-On allows non-HTTPS communication over private IP addresses like localhost, 192.168.x.x, and other private IP addresses. In production, you should make sure SSL is enabled and required across the board. On the adapter/client side, Red Hat Single Sign-On allows you to turn off the SSL trust manager. The trust manager ensures identity the client is talking to. It checks the DNS domain name against the server’s certificate. In production you should make sure that each of your client adapters is configured to use a truststore. Otherwise you are vulnerable to DNS man in the middle attacks. Cross-site request forgery (CSRF) is a web-based attack whereby HTTP requests are transmitted from a user that the web site trusts or has authenticated with(e.g. via HTTP redirects or HTML forms). Any site that uses cookie based authentication is vulnerable to these types of attacks. These attacks are mitigated by matching a state cookie against a posted form or query parameter. The OAuth 2.0 login specification requires that a state cookie be used and matched against a transmitted state parameter. Red Hat Single Sign-On fully implements this part of the specification so all logins are protected. The only part of Red Hat Single Sign-On that really falls into CSRF is the user account management pages. To mitigate this Red Hat Single Sign-On sets a state cookie and also embeds the value of this state cookie within hidden form fields or query parameters in action links. This query or form parameter is checked against the state cookie to verify that the call was made by the user. For the Authorization Code Flow, if you register redirect URIs that are too general, then it would be possible for a rogue client to impersonate a different client that has a broader scope of access. This could happen for instance if two clients live under the same domain. So, it’s a good idea to make your registered redirect URIs as specific as feasible. There are a few things you can do to mitigate access tokens and refresh tokens from being stolen. The most important thing is to enforce SSL/HTTPS communication between Red Hat Single Sign-On and its clients and applications. It might seem obvious, but since Red Hat Single Sign-On does not have SSL enabled by default, an administrator might not realize that it is necessary. Another thing you can do to mitigate leaked access tokens is to shorten their lifespans. You can specify this within the timeouts page. Short lifespans (minutes) for access tokens for clients and applications to refresh their access tokens after a short amount of time. If an admin detects a leak, they can logout all user sessions to invalidate these refresh tokens or set up a revocation policy. Making sure refresh tokens always stay private to the client and are never transmitted ever is very important as well. You can also mitigate against leaked access tokens and refresh tokens by issuing these tokens as holder-of-key tokens. See OAuth 2.0 Mutual TLS Client Certificate Bound Access Token to learn how. If an access token or refresh token is compromised, the first thing you should do is go to the admin console and push a not-before revocation policy to all applications. This will enforce that any tokens issued prior to that date are now invalid. Pushing new not-before policy will also ensure that application will be forced to download new public keys from Red Hat Single Sign-On, hence it is also useful for the case, when you think that realm signing key was compromised. More info in the keys chapter. You can also disable specific applications, clients, and users if you feel that any one of those entities is completely compromised. For the OIDC Auth Code Flow, it would be very hard for an attacker to compromise Red Hat Single Sign-On authorization codes. Red Hat Single Sign-On generates a cryptographically strong random value for its authorization codes so it would be very hard to guess an access token. An authorization code can only be used once to obtain an access token. In the admin console you can specify how long an authorization code is valid for on the timeouts page. This value should be really short, as short as a few seconds and just long enough for the client to make the request to obtain a token from the code. An attacker could use the end-user authorization endpoint and the redirect URI parameter to abuse the authorization server as an open redirector. An open redirector is an endpoint using a parameter to automatically redirect a user agent to the location specified by the parameter value without any validation. An attacker could utilize a user’s trust in an authorization server to launch a phishing attack. Red Hat Single Sign-On requires that all registered applications and clients register at least one redirection URI pattern. Any time a client asks Red Hat Single Sign-On to perform a redirect (on login or logout for example), Red Hat Single Sign-On will check the redirect URI vs. the list of valid registered URI patterns. It is important that clients and applications register as specific a URI pattern as possible to mitigate open redirector attacks. Red Hat Single Sign-On does not store passwords in raw text. It stores a hash of them using the PBKDF2 algorithm. It actually uses a default of 20,000 hashing iterations! This is the security community’s recommended number of iterations. This can be a rather large performance hit on your system as PBKDF2, by design, gobbles up a significant amount of CPU. It is up to you to decide how serious you want to be to protect your password database. By default, each new client application has an unlimited role scope mappings. This means that every access token that is created for that client will contain all the permissions the user has. If the client gets compromised and the access token is leaked, then each system that the user has permission to access is now also compromised. It is highly suggested that you limit the roles an access token is assigned by using the Scope menu for each client. Or alternatively, you can set role scope mappings at the Client Scope level and assign Client Scopes to your client by using the Client Scope menu. In environments where the level of trust among services is low, it is a good practice to limit the audiences on the token. The motivation behind this is described in the OAuth2 Threat Model document and more details are in the Audience Support section. At this point in time, there is no knowledge of any SQL injection vulnerabilities in Red Hat Single Sign-On.